We have lift-off! At the beginning of the year we embarked on our progression routes research journey, Taking Off. Consultant researchers Catherine Carter and Kate Wakeling, and the team here at Sound Connections, have been gathering information from organisations across London who provide music-making opportunities for young people facing challenging circumstances. The research looks at the musical progression journeys supported by these organisations: the barriers to progression their young people face; where they recruit young people from; where they refer to; and what meaningful progression looks like in their context. 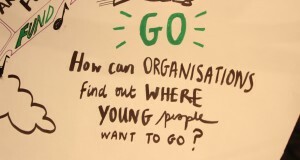 We’ve heard from organisations ranging from those working at grassroots level exclusively with particular categories of challenge, such as mental health, youth justice and disability, through to orchestras, venues and Music Education Hubs. Economic deprivation is by far the most common challenge faced by the young people represented in the survey although around half the respondents said that 50-100% of their project participants face two or more barriers to access and progression. We’re delighted also to welcome a team of Young Researchers to the project: Adem Holness from Wired4Music; Lilly Cook from Heart n Soul; Scarlett Stewart from Kinetika Bloco, with a Croydon SEND project; Shakira Alleyne from Raw Sounds, south London mental health project. Adem, Lilly, Scarlett and Shakira, are creating case studies about overcoming barriers to progress musically from the young person’s perspective. What next on the journey? We’re looking forward to unveiling the first stage of the research as a map illustrating challenging circumstance progression journeys soon.